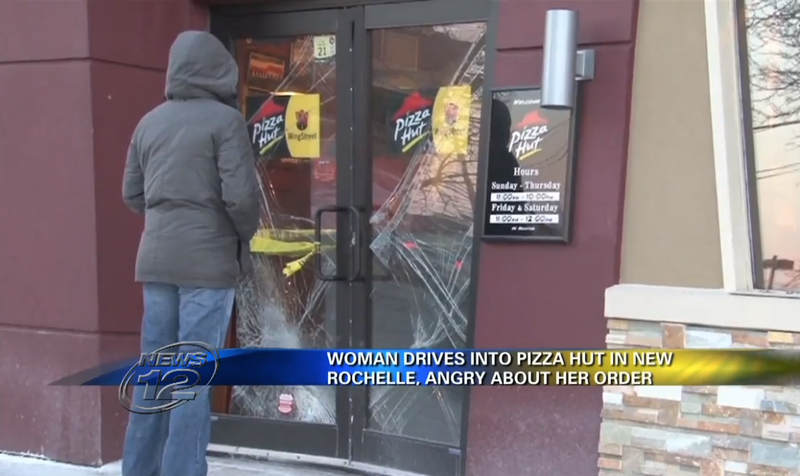 Here’s the latest from the To-Go Food Overreaction File: Police in New York arrested a woman yesterday for smashing her car into a Pizza Hut after the eatery reportedly lost her order. The Lower Hudson News reports that the Pizza Hut in New Rochelle, NY, was the victim of a hit and run after an angry customer backed her Volkswagen Jetta into the building and then drove off. Witnesses on the scene gave reporters different explanations for what had set the customer off, but according to News 12 Westchester, police say the driver was upset because she’d placed an order online only to arrive at the Hut and find no pie waiting for her. The woman drove off after the crash, which cracked the glass of the Hut’s doors, but police were able to locate her and put her under arrest.